This bouncing, stretching putty can be squeezed, kneaded, snapped. This bouncing, stretching phenomenon can be squeezed, kneaded, snapped, stretched, and popped. 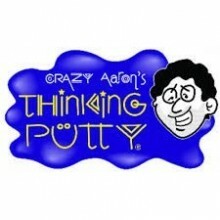 Thinking Putty builds hand and finger strength through a fabulous tactile play experience with unique, unexpected properties and provides relaxing, yet stimulating interaction for children with ADHD, Autism, Fragile-X and other sensory integration issues.